Adaptation of living organisms to different stresses and environments results from genetic modifications and restructuration of regulatory and metabolic networks. Our team is mostly interested in understanding and quantifying this adaptive potential in microorganisms. We aim at characterizing the molecular and ecological mechanisms involved in the evolutionary dynamics of microorganisms. In particular, we seek to link genetic/genomic modifications with phenotypic changes related to diverse biological functions, some of which (virulence, antibiotic resistance) are directly linked to public health. For example, we work with Pseudomonas aeruginosa and Escherichia coli strains. We also exploit the past and present evolutionary information to decipher fundamental mechanisms used by microorganisms and to predict future evolutionary outcomes. Our objective is to develop an evolutionary systems biology framework through interdisciplinary expertise including experimental evolution, cell biology, genetics, biochemistry, comparative genomics, phylogenomics and biophysical modeling. The evolution of microbial systems is investigated along three research axes: genome evolution, metabolism evolution and experimental evolution. In particular, we analyze the longest-running laboratory evolution experiment on Earth. This experiment is the one initiated by Richard Lenski (Michigan State University) with who we collaborate since more than 20 years. 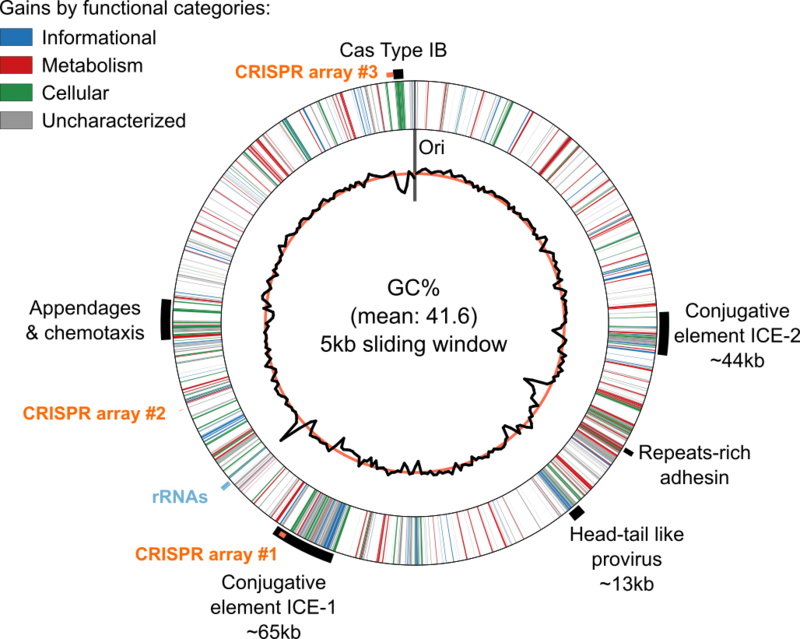 Twelve populations of Escherichia coli are propagated from a common ancestor since 1988 by serial daily transfers in an environment limited for its carbon source (here, glucose). This experiment therefore represents 70,000 generations of evolution from a common ancestor (Figure below). The ancestor together with samples collected in each of the twelve populations at 500-generation intervals are conserved at -80°C, thereby providing complete and living fossil archives!! The great concepts of evolution, as well as the precise molecular and ecological mechanisms, can be addressed in an unprecedented and rigorous way owing to this unique collection. We develop our interdisciplinary research along three main lines owing to the complementary expertise of the GEM team members. Genome evolution: in order to understand how natural selection shapes genomes and to identify the most dynamic biological traits during evolution, we study the link between genome changes and plasticity of the regulatory and metabolic networks. We aim at revealing the mechanisms that sustain adaptation, diversification, co-existence of bacterial lineages and antibiotic resistance. Moreover, we combine these evolutionary approaches with integrative analyses from systems biology in order to evaluate the evolvability and robustness of genomes and networks. 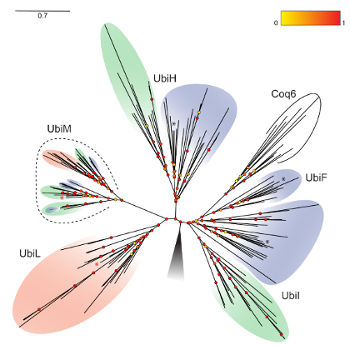 Finally, we use and develop bioinformatics tools useful for comparative genomics and phylogenetics, with the goal to understand the molecular origins of the diversification of both archeal and bacterial genomes. This includes the evolutionary analysis of gene content, of genome structuring, of specific cellular machineries and metabolic pathways. These projects rely in particular on the large-scale analyses of “omic” data sets. Evolution of metabolism: in order to predict the capacities of metabolic adaptation of microorganisms facing perturbations, including environmental changes and genetic defects, we aim at characterizing all genes involved in specific metabolic pathways like the biosynthesis of lipids and quinones. We combine experimental approaches (genetics, biochemistry), bioinformatics and comparative genomics to understand how metabolic pathways function and how they evolved. We also develop computational approaches to identify evolutionary modules in metabolic networks. 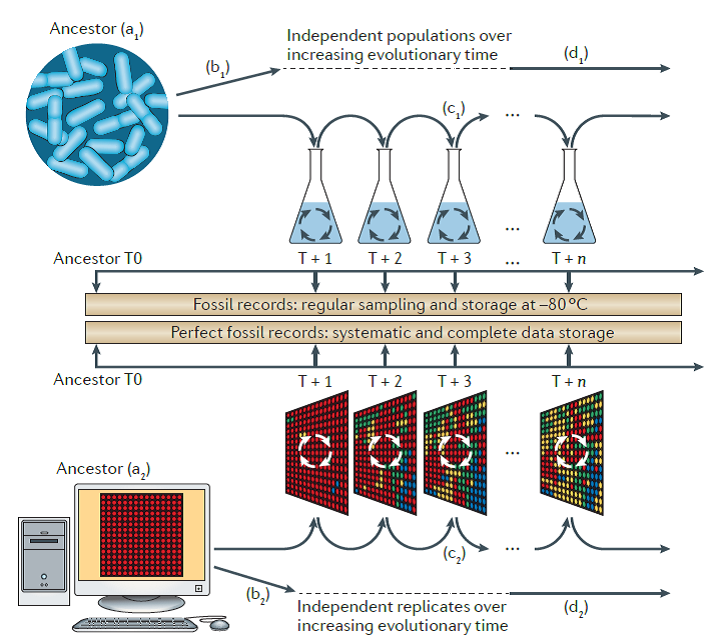 Experimental evolution: to obtain a quantitative description of the ecological, molecular and genomic mechanisms of natural selection, we directly analyze evolution through long-term bacterial in vivo evolution experiments and in silico evolution of digital organisms. Notably, we study the world’s longest-running evolution experiment, which represents more than 65,000 generations of the Escherichia coli bacterium (Figure). The main objectives are to characterize phenotypic innovations and the underlying mechanisms linked to: i) interactions between genes, gene products and intracellular metabolites, ii) interactions between bacterial lineages, iii) environmental factors (available resources, selective pressures including antibiotics). The dynamics of regulatory and metabolic networks are analyzed in view of genome changes. Program 1: Evolution of mutation rates and mobile genetic elements (J. Gaffé, T. Hindré, D. Schneider). Program 2: Evolution of the physical structuring of genomes (I. Junier, S. Abby). Collaborations with Paris-Saclay (Frédéric Boccard), Collège de France (Olivier Espéli, Olivier Rivoire), University of Toulouse (Yves Bouet), CRG Barcelona (Luis Serrano), University of Barcelona (Felix Ritort). Program 3: Phylogenomic and experimental studies of diversification mechanisms in prokaryotes (S. Abby, D. Schneider, I. Junier, J. Gaffé, T. Hindré). Collaborations with Institut Pasteur (Eduardo Rocha), University Lyon 1 (Vincent Daubin), University of Bergen (Steffen Leth Jørgensen), Collège de France (Olivier Rivoire), Michigan State University (Richard Lenski), University of Warwick (Orkun Soyer). Program 4: Metagenomic analysis of patient’s intestine microbiota (A. Suau-Pernet, D. Schneider). Collaboration with Génoscope (Claudine Médigue, Stéphane Cruveiller). 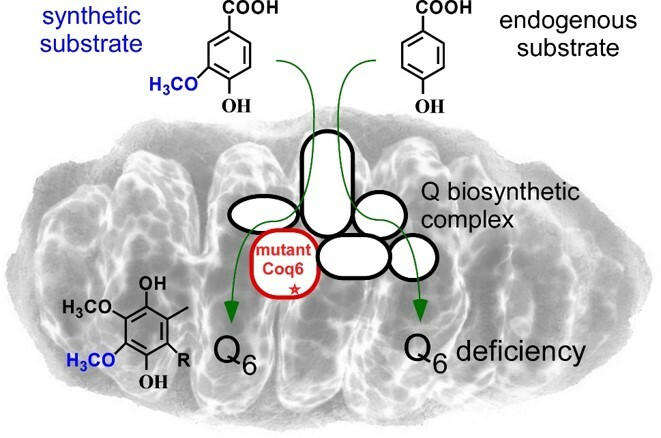 Program 5: Biosynthesis of quinones and adaptation of the lipid composition of bacterial membranes (F. Pierrel, L. Pelosi, C. Mercier, S. Abby, I. Junier, D. Schneider). Collaborations with Collège de France (Marc Fontecave), Pasteur Institute (Frédéric Barras), University of Padova (Leonardo Salviati), Institute for Advanced Biology of Grenoble (Cyrille Botté), Technical University of Denmark (Soeren Molin et Helle Krogh-Johansen), University of Normandy (Marc Feuilloley). Program 6: Evolution and plasticity of central metabolism (S. Abby, I. Junier, L. Pelosi, F. Pierrel, D. Schneider, T. Hindré, J. Gaffé, A. Suau-Pernet). Collaborations with University of Vienna (Christa Schleper), Green Center for Systems Biology in Dallas, USA (Kim Reynolds). Program 7: Molecular and ecological analyses of the first steps of speciation (D. Schneider, J. Gaffé, T. Hindré). Collaborations with Michigan State University (Richard Lenski), University of Warwick (Orkun Soyer). Program 8: Dynamics of regulatory networks (T. Hindré, I. Junier, A. Suau-Pernet, D. Schneider). Collaborations with Michigan State University (Richard Lenski), the University of Texas Austin (Jeffrey Barrick)). Program 9: Evolution of antibiotic resistance and tolerance (D. Schneider, J. Gaffé, M. Martin). Collaboration with Michigan State University (Richard Lenski). Program 10: in silico evolution and applications (serious game about antibiotic resistance, evolutionary music) (D. Schneider). Collaboration with INRIA Lyon (G. Beslon). The GEM team members teach microbiology, microbial genetics, molecular and cellular biology, host-pathogens interactions, biochemistry, parasitology, systems biology, computational biology in undergraduate and master’s programs. Our team members belong to several sections of the National Council of Universities (CNU 64 and 65) and several sections of the National Center for Scientific Research (CNRS 16, 21, 51). Dominique Schneider is a member of CNU’s section 65. Moreover, team members are in charge of the coordination of various teaching units in Bachelor’s and Master’s degrees in Biology and Chemistry-Biology (Biomolecular components of the cell, Genetics, Host-pathogen interactions, Infectious diseases, Microbiology, Systems biology, bioengineering, bioindustries and applied microbiologie) and held several important responsibilities in different committees.